Linux Mint 18.3 Cinnamon Review: Best 'Linux' Distro for Beginners! Now, both Linux Mint 18 Cinnamon (which I reviewed last year) and Linux Mint 18.3 Cinnamon are based on Ubuntu 16.04 LTS. However, Linux Mint 18.3 is based on the up-to-date Ubuntu 16.04.3 LTS. This is good news for me because the touch-pad of my Asus laptop had a major issue with Ubuntu 16.04 LTS (or in pretty much any distro that had a Kernel version below 4.10) where it refused to work after waking up from ‘Suspend’. This was fixed in Kernel 4.10 which Linux Mint 18.3 Cinnamon features, lucky me I guess 🙂 . I’ve compared the performance data of Linux Mint 18.3 Cinnamon (Boot-up speed, Memory usage, Power usage, System responsiveness, shutdown delay…) with Linux Mint 18 Cinnamon and Ubuntu 17.10. I could’ve added Ubuntu 16.04 LTS data too, but that was tested on my old Dell laptop which breaks the purpose of comparing performance, so I skipped it. Not only all these 3 operating systems were tested on the same hardware, they were also installed into the exact same partition table. I also made sure to securely delete data on the test partitions (efi, boot and ‘root’) using the ‘shred’ command so that I’m left with a ‘clean’ system. I tried not to tweak any settings before measuring the performance data (to keep their accuracy as high as possible of course). The only changes I made were enabling the user auto-login while installing, and disabling the update managers (both ‘minstinstall’ software manager and the Flatpak update manager, more on them later) & welcome screen on desktop start-up. 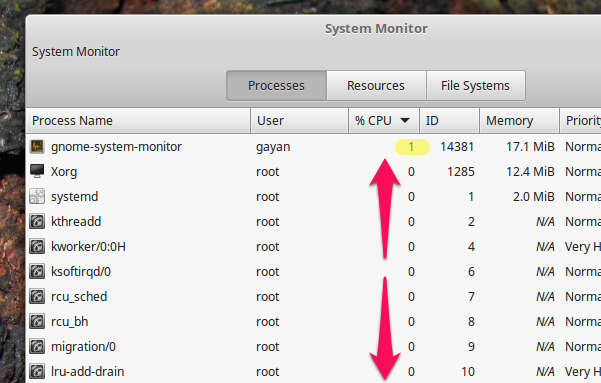 I also added ‘system monitor’ app icon to the panel for measuring the memory usage. This is also crucial on many occasions and when possible this is something I always do. The reason is very simple. If I were to open it through the start-menu (by either searching for it or by navigating) that would’ve easily added few more megabytes to the memory consumption reading thus reducing its accuracy. Linux Mint uses Ubuntu’s awesome installer without any custom features, it’s a very popular installer so I won’t go into the details. However, once I was done with the partition setup the installer warned me for not having created a swap partition (a ‘swap partition’ is identical to what Microsoft Windows calls the ‘page file’ which is a virtual ‘RAM’ that sits on your main storage device. In many cases, having one can help for maintaining stability and performance). Starting with 17.04, Ubuntu creates a swap file (a file, not a partition) automatically while installing, but since Linux Mint 18.3 is based on Ubuntu 16.04.3 LTS, this feature is missing. This is not by any means a big concern, after all you can always manually create one pretty easily, but it would’ve been nicer to have it created automatically. Other than that, all went well. I’ll skip the GRUB & the Boot-Logo because they haven’t changed, plus, capturing them is also a bit difficult. The desktop is pretty much identical to the one I saw in Linux Mint 18. The desktop context menu however, is slightly changed. The ‘Show Hidden files’ option is gone, and ‘Organize Desktop by Name’ & ‘Keep Aligned’ functions are moved into the ‘Desktop’ menu, which also gives you access to few new options as well. I like it. The previous Linux Mint 18 I reviewed also featured a new theme called ‘Mint-Y’ which I quite liked. For some reason, it’s been removed in this release, (or maybe in 18.2, I don’t know) did I miss something? I think it’s time for a change as far as the look-n-feel of this operating system is concerned. 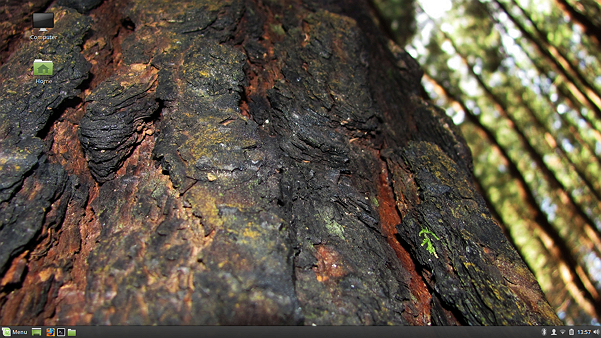 That said, Linux Mint 18.3 features gorgeous looking set of wallpapers, I love them! Below screenshot shows only a fraction of them. Another neat new feature is the new progress bars that are displayed on the bottom task-bar. This is incredibly helpful while doing things like copying files. The software manager has also gone through some major changes. According to its developers, now it’s 3 times faster (I certainly felt an increase in its speed) and no longer uses Webkit. As long as just browsing through software, users no longer need to enter the administrative password. It only asks for the password for installing software packages, and popular software are featured by default. The other easily notable change in the Software Manager is the Flatpak integration (Flatpak, just like Snappy of Ubuntu, is a different packaging system for ‘Linux’ operating systems where it lets developers to release their software as a single package, with all its dependencies included, so that it’s guaranteed to run in any modern ‘Linux’ distribution. One downside is the size of the package can grow tremendously compared to traditional packages). While Flatpak & traditional (‘deb’) packages are kept and handled (running & updating) separately, the Software Manager seamlessly integrate the ‘two worlds’ together. By default Linux Mint 18.3 features a large number of Flatpak packages, but you can manually add sources that provide them as well. I really, really like these few yet major improvements that have landed on the Software Manager. Installing proprietary ‘deb’ packages also worked without any issue too. The reason I mentioned this because certain Ubuntu versions struggled while installing proprietary packages, so I just checked it, just in case. This release features many other improvements and some new applications such as ‘Timeshift’ (a snapshot based backup utility). 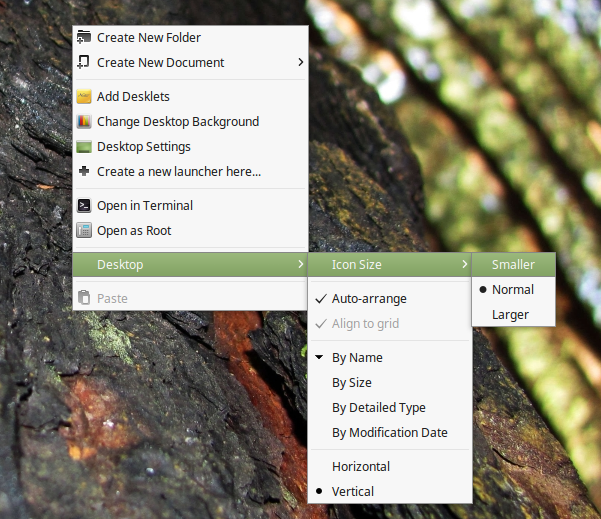 To learn about these changes, please refer to this official Linux Mint 18.3 article. I don’t test Adobe flash compatibility anymore because the Internet is gradually moving away from it. 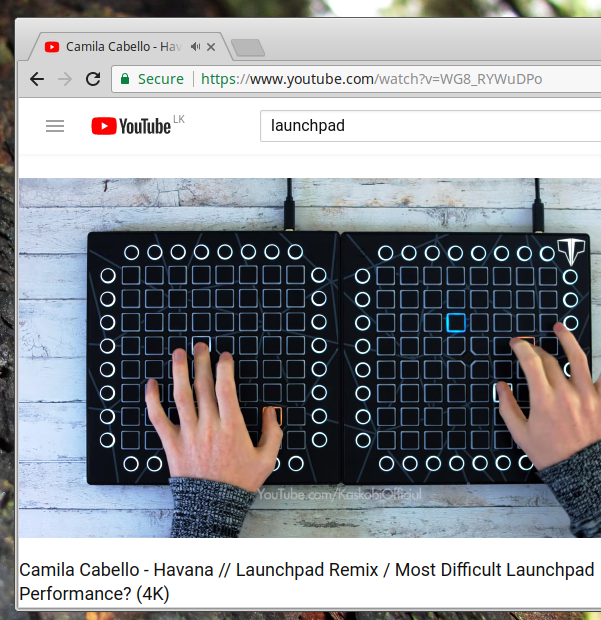 That said, I did install Google Chrome (because that’s what I prefer as a web browser) and for what it’s worth, HTML5.0 video playback has been flawless on websites that I usually visit (such as on YouTube). 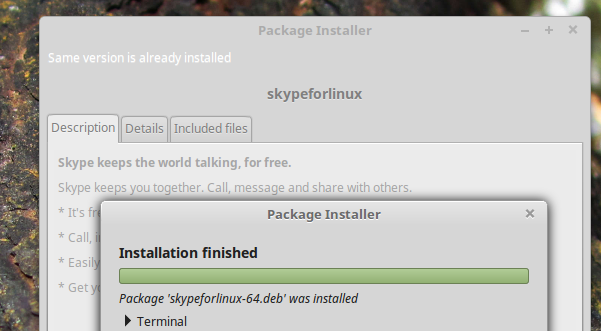 I installed the latest Skype version (8.11.04) for ‘Linux’ and made 3 calls (one with video feed on, other 2 without video). Video call lasted about 5-6 minutes, while the audio calls lasted for about 20-30 minutes each. All in all, everything worked perfectly well. 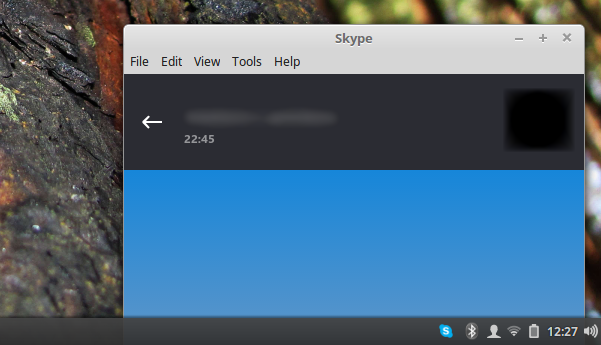 Yes the Skype system tray icon worked flawlessly as well. As I mentioned earlier, I was careful not to tweak major settings to keep the accuracy of the measurements high. I forgot to mention that, as always, after installing the LM 18.3 Cinnamon, I boot into the newly installed operating system 5-6 times to let things settle down (such as one time app wizards to be done with their work). This is something I always do when reviewing any ‘Linux’ operating system. Then I took approximately 5 samples of Boot-up Times, Memory Usage & Shutdown Delay for coming up with average values. I only took one sample for calculating the power usage because the application I use to calculate it takes care of everything and it’s highly accurate. I also ran the System Responsiveness test twice (more on that later). So let’s dive into the details. I use the timer app of my Android phone while measuring the Boot-Up times. I started to measure as soon as I hit Enter at the GRUB prompt and stop measuring when the desktop is loaded. I do not necessarily wait till all the applications on the system tray (for instance) are loaded. If I feel like the desktop has reached a state where I can start using it (such as the file manager or open programs), then I stop measuring. And on most ‘Linux’ distributions, by the time I stop measuring, the desktop is fully loaded anyway. 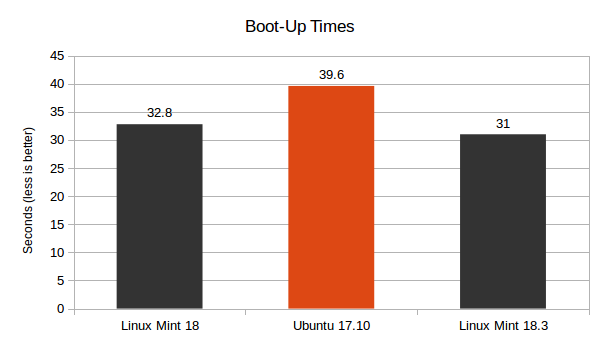 Linux Mint 18.3 is marginally faster than Linux Mint 18 (5.4%), but compared to Ubuntu 17.10 it’s 21.8% faster. Before I open up the system monitor application the desktop comes with, I make sure to wait 10-12 seconds, even after the desktop is fully loaded. This is usually helpful because usually Update managers (whenever possible, I disable them from running because they have a tendency to fluctuate the memory usage readings, though you can’t disable them in certain distributions) are executed with a certain delay, thus their memory usage is also included by the time I measure the Memory Usage. 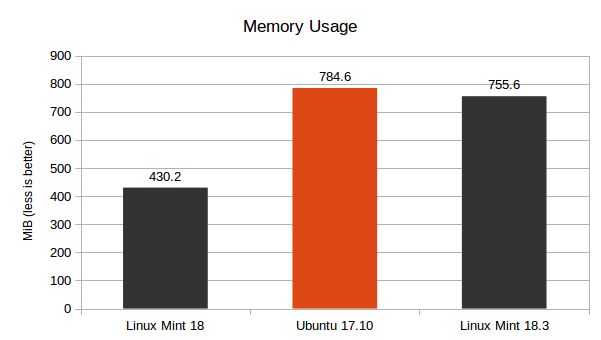 As you can easily observe, Linux Mint 18 is impressively lean on memory usage where Linux Mint 18.3 consumed 75.6% more memory. Compared to Ubuntu 17.10 though LM 18.3 is marginally lean (3.7%), nothing impressive. When the system is in an ‘idle’ state, meaning that the end-user is not using the computer and there are no currently running user applications, then the CPU usage should drop somewhere around to zero. However, even in such states, due to bugs in software programs, or operating systems that have been hit by viruses or, poorly optimized operating systems, can keep consuming the CPU at high values. 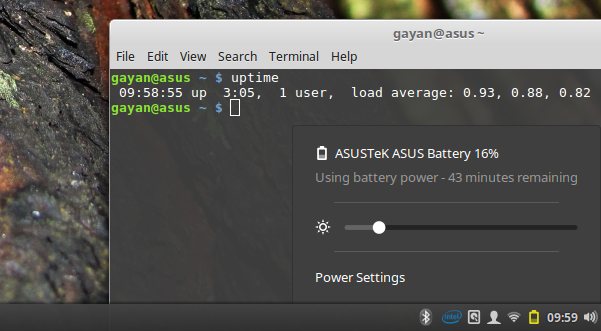 Not only this degrades performance, on a mobile computer, such as on a laptop, this can lead to short battery life as well. But as you can see, Cinnamon 3.6 did a great job while in an idle state. Only the ‘system monitor’ app used 1% of total CPU power here & there, and the rest of the applications leave the CPU alone. Very nice. 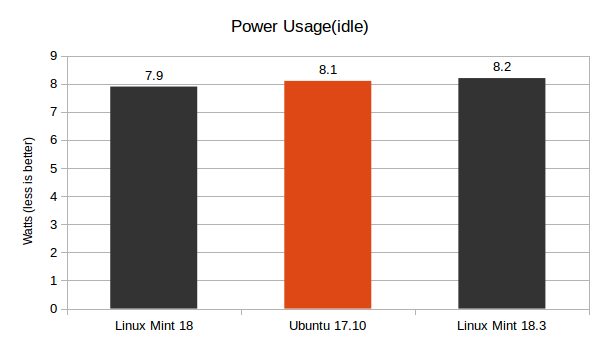 In terms of power usage (again, when the system is in an idle state), Linux Mint 18 was the most efficient where compared to Linux Mint 18.3 it used 3.8% Watts of less energy (nothing significant, though). The other two scored pretty much on the same level. After installing ‘tlp’, the power consumption was cut down by around 24%! Once the battery was fully charged, with the screen brightness set around 17-20%, Wi-Fi turned ON and connected to the wireless router (Bluetooth was turned OFF), I was able to use the laptop for about 3 hours and 5 minutes. Now if you compare this to the battery run-time of Ubuntu 17.10 (I don’t have the number from Linux Mint 18), Ubuntu 17.10 scored an impressive 4 hours and 36 minutes. 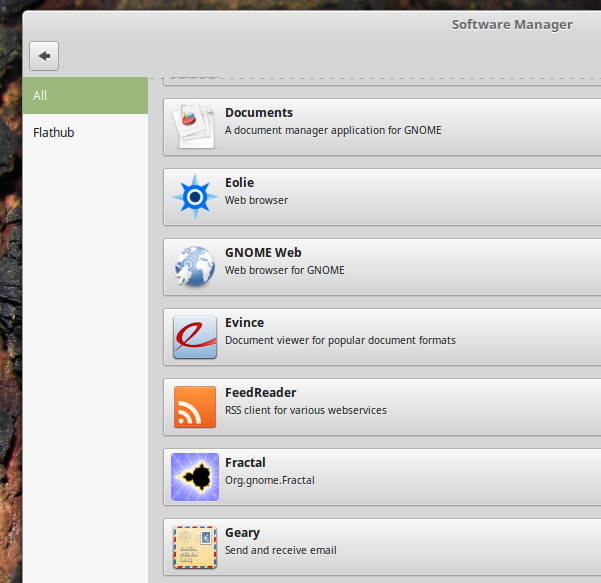 But the circumstance were a bit different on Linux Mint 18.3. Not only I was writing this article on it with 6-8 web browser tabs opened (with some multimedia files playing in the background), but I was also running Virtualbox along side it with my USB hard drive connected to the laptop because that’s where Virtualbox guest operating systems are installed. Given the workload, I’m pretty happy here. Hardware recognition was excellent. Mint was able to automatically configure all of my hardware. I never had any issues whatsoever. Screen brightness|Wireless adapter’s state etc were all restored to the previously set state each time I loaded the desktop, and as pointed out in the beginning of this Linux Mint 18.3 review, my touch-pad was also worked perfectly well. However, like many ‘Linux’ distributions, Linux Mint 18.3 Cinnamon doesn’t ship with proprietary hardware drivers, such as the official Nvidia GPU drivers which is a must have if you have a gaming ‘Linux laptop’. But installing such drivers is pretty easy, because Mint includes the (GUI) utility Ubuntu gives you. All that you have to do is to open it and if such drivers are available for your system then it’ll display them and you just have to click on them and they’ll be all automatically installed. As far as the end-user is concerned, I prefer the driver installer GUI of Linux Mint 18.3 over Ubuntu 17.10 because this one only does one thing, giving you the ability to install proprietary drivers, and only that. But in Ubuntu 17.10 this utility is listed in a tab under ‘Software & Updates’ GUI. Yes it’s true that you don’t have to be a ‘Linux’ expert to figure things out, it’s just that things (even the little things that matter) in Linux Mint 18.3 Cinnamon are much more enhanced. Small improvements such as these (such attention to details can be observed on other apps such as Software Updater in LM 18.3. I’ve pointed these out in my Linux Mint 18 review, so I won’t go over it here again) matter when it comes to end-user friendliness. It’s due to many of these subtle enhancements I called Linux Mint 18.3 Cinnamon the best ‘Linux’ distro for beginners (you’ll see for yourself, if you try it). 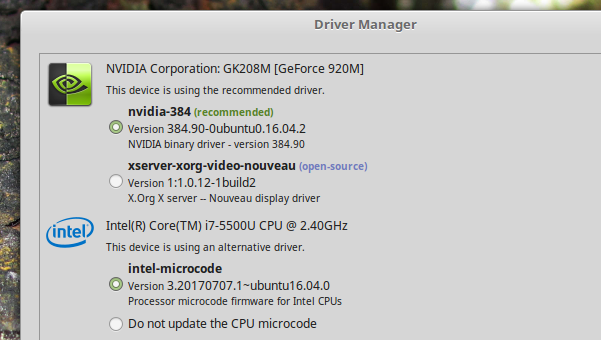 I’ve also run the system on the proprietary driver of my Nvidia 920M for about 5-6 hours, everything was perfect. I watched lots of YouTube videos in Google Chrome and few multimedia files (including a movie) in VLC, no issues whatsoever. As mentioned, stability is top-notch! I haven’t seen a single application crash so far. This is a test that I’ve developed to get a sense of the responsiveness of an operating system. I usually copy a file (1.5GB -2GB) within two locations of the user’s ‘Home’ folder. Then as soon as the file copy operation is under way, I try to play a multimedia file (usually a 720p video in VLC, yes on most cases, I have to manually install it) and then I try to open a few applications by searching in the main-menu or the start-menu (if such functionality is available). When all that is happening, I also try to open a location that includes reasonably large number of files/folders (e.g: /usr/bin) in file manager. Then I observe the following. If the video player was able to play the multimedia file without too many interruptions, and if most of the applications were opened before the file copy job finished, if file manager was able to open the location (I don’t seriously take note of this ‘test’ because by now the system is under heavy stress, but if was opened successfully, it’s a big ‘plus’) and while all this is happening, if the sensitivity of the cursor was not majorly lost, then I consider that operating system to be a responsive one. It is also worth noting to you again that this test is being run on the much slower (5400 rpm) SATA drive, not on the faster SSD. So how did it go in Linux Mint 18.3 Cinnamon? VLC was never was able play the multimedia file until the file copy job finished. However, most of the applications were opened, some more memory hungry ones such as LibreOffice (including the file manager that was opening the ‘/usr/bin‘ directory) opened with an easily felt delay. It was certainly not top-notch, especially given the fact that VLC was never able to play the multimedia file in time. However, then I checked which I/O scheduler (the utility that controls input/output operations of the hard disk) was in use, it was ‘CFQ’. I knew from experience that it was ‘CFQ’ but I was still very impressed by the overall performance of Linux Mint 18.3 under ‘CFQ’. Because Ubuntu 17.10 for instance, was very disappointing while operating under the shadow of ‘CFQ’. If it wasn’t for VLC, I would’ve given Linux Mint 18.3 Cinnamon 4 stars, because even under ‘CFQ’ it was that good. But I’ve been able to totally reverse such disappointing results under many ‘Linux’ distributions while testing on my laptop by simply changing the I/O scheduler to ‘deadline’. So I did that in Linux Mint 18.3, reboot the laptop and re-ran the test. VLC was able to play the multimedia file very quickly and all the applications (including the file manager) were able to open themselves up before the file copy was finished. I actually opened up lots of apps in Linux Mint 18.3, more than I did in Ubuntu 17.10. I even executed GIMP which is quite disk bound while opening, and it was only Cinnamon was trying to open GIMP the VLC playback was interrupted, but even that only happened once and lasted only for a fraction of a second! In Ubuntu 17.10, VLC playback was interrupted at least two times (says my notepad) but there was no GIMP in Ubuntu 17.10! The start-menu’s ability to find applications extremely quickly, even under such disk stress, is quite impressive. I’ve seen this with in almost all Linux Mint’s Cinnamon editions I’ve reviewed so far. As mentioned in the beginning, such excellence can only be experienced in Cinnamon in Linux Mint in my experience. If I had to give it a rating, I’d give it 4.8 stars out of 5. She’s a keeper! 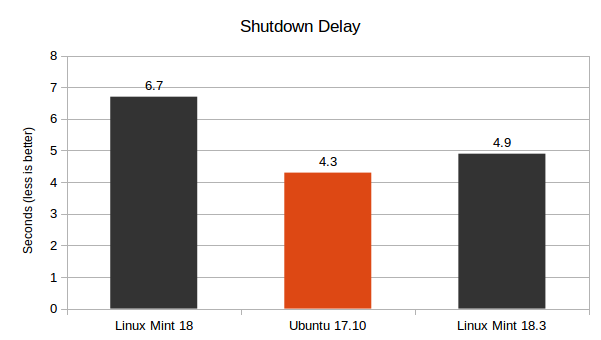 Linux Mint 18.3 Cinnamon was able to shutdown 27% faster compared to Linux Mint 18, although compared to Ubuntu 17.10 it was 14% slow. But why should you care, it’s capable of shutting down in 5 seconds. Linux Mint 18.3 Cinnamon has gained some ‘weight’ compared to the Linux Mint 18 Cinnamon I reviewed last year. So yes it’s memory foot print has increased by 75% which is a lot. But then again, this is within the range of average memory usage of modern GNOME3 desktops that I’ve reviewed, so no it’s no ‘anomaly’. Plus, even though the memory footprint has increased, Linux Mint 18.3 Cinnamon still boots fast (22% compared to Ubuntu 17.10), power efficient, extremely stable & impressively responsive. Last but not least, it comes with a set of enhanced end-user applications that are beginner friendly. So if you’re coming from a strong Microsoft Windows background or if you’re someone new to ‘Linux’, or even if you’re an experienced end-user, I would highly recommend Linux Mint 18.3 Cinnamon edition to you. If interested, please download it from here. Thank you for reading! Please compare Mint Cinnamon to Mint XFCE. I think many Mint users would be interested in your findings. Thank you for the suggestion Rich, I’ll think about it. Thanks for your review, it’s always nice to see someone who goes to the trouble of measuring boot time, memory usage etc and then comparing it to earlier versions of Mint and Ubuntu. It would be nice if you could also compare system temperature and software installation/removal times. I used to be a big fan of Mint, using the Mate version because it was lighter and faster and had a simpler interface to get work done. Then around Mint 17.3 and even on 18, my WiFi would get disconnected after waking from sleep and I had to restart my laptop when this happened. I switched to Solus Mate 2017.01.01.0 about 10 months ago and now I’m on Solus Mate 3, upgrading to two new major versions without ever having had to reinstall. In that time I was surprised to get Mate 1.18 about a week after it was released and always on the latest LibreOffice version etc. For me Solus is a stable rolling release Linux distro done right. There are minor bugs which I would not see with Mint but overall the faster boot time and speed of Solus outweighs the polish of Mint. The great thing about Solus is a single update can completely resolve a bug, so the longer you use it, the more stable it gets. I wanted to suggest that you do another review for Linux Mint 18.3 Mate as it’s more likely to use less memory and you can compare it to the Cinnamon data. You should also mention how Mint 18.3 KDE will be the last version with KDE available in Mint. Solus will release a KDE version eventually, maybe before mid-2018, and from this post (https://plus.google.com/u/0/+Solus-Project/posts/hn58dxgPee8) it looks like it will be even lighter on memory usage than Solus Mate, at 370 MB ! You should show data comparing all the current Mint 18.3 editions (Mate, Cinnamon, KDE and Xfce) and also include Mint 18 to see how memory usage, battery life has evolved. After that, compare all the current Solus editions (Budgie, Gnome and Mate) and maybe include older versions of Solus if you can still find the iso files for them. Finally you can combine all your data and show us whether it’s Mint or Solus Mate which is lighter, and then find the overall best distro and edition which is lightest, fastest and most stable. You can also make a list of software you expect in a distro and compare Mint and Solus. Right now Solus has most software a new Linux user could need, and it’s quite easy to ask for software to be added to the Solus repository as long as it’s actively maintained and accepted for inclusion by the Solus developers. Once Mint 17.3 and 18.3 KDE reach end of life in 2019 and 2021 respectively, I imagine Solus KDE will be the go-to stable KDE distro with the added benefit of being stable rolling release and not being hindered by an Arch or Ubuntu base for certain bugs or performance. Thank you for the comment (very informative). I’m really pleased that it works out great for you, but with all due respect, I’m not a fan of MATE. I think it’s a lost cause. I mean think about it, it still use Gtk 2+… it’s not going to last that long. It’s time to move on. That said, if Solus releases a KDE version, I’ll definitely review it, these days my main desktop is KDE and I’m loving it! Gayan > I’m not a fan of MATE. I think it’s a lost cause. I mean think about it, it still use Gtk 2+… it’s not going to last that long. Not so. MATE 1.18 has completely transitioned to GTK+3. It also uses more resources than before because of that. XFCE still uses GTK+2 and much less resources. Huh, okay then! I guess I’ve been missing out a few things. Thanks Mike. 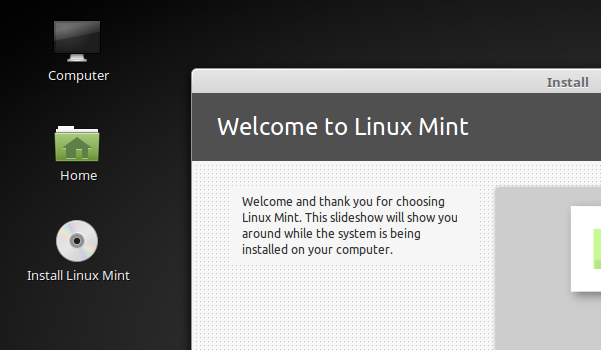 Good review have not tried Mint for a couple of years, Its a great distro that just works out the box. Alas I soon get bored with it never been able to put the finger on the reason, its just feels boring to me, its such a shame as it really is a great distro one of the best I would say. Hmm, there is some truth to that, you know it being a little bit boring. But I guess that’s mostly because of the theme (that’s why I said in the article, it’s time to change things a bit). I use Mint on several systems, even on my Arcade Cab. Starting from a Athlon Xp 2100/Ati 9200/750 meg. Now a Core 2 duo e8400 / Geforce 9500 / 4 Gig of ram. No need to upgrade this system any time soon, it’s running great. As always, thanks very much. Finally an OS review that can rightly be called a review! Thank you Sam, appreciate it 🙂 . where can I get linux mint. A great article. Thanks. I am not a computer geek, nor am I totally computer illiterate, but switching over to Linux Mint from Win 7 has had me worried (even scared) but I have had it with Windows, period!!! I have read every article on the internet I could, copied them, re-read, et al, then downloaded the ISO, made DVDs (I have 64 and 32 bit computers) and even made a bootable USB (w/Etcher). But my year old Lenovo laptop B50 80LT, wasn’t supposed to be able to run Linux due to UEFI stuff and secure boot problems, etc, etc. I read to trash the laptop rather than ever hope I could get Linux working on it. BUT, I just (10 min ago) plugged in my USB, started the computer and bingo, Linux was up and running and I didn’t have to do a thing but breathe through it (ha ha). Now all I have to do is read more about installing it permanently THEN figuring out how to use everything, then it goes onto my main computer (another Lenovo) and several others – – but now I’m no longer afraid of it. I am empowered!!! Thank you Gayan, and to everyone who has ever had a hand in developing Linux. I can’t wait to show off to my non computer geek friends who also hate MS Windows and the security issues of that OS. We’re finally free!!! You’re welcome Morgan. Modern ‘Linux’ distributions run on UEFI, it’s the ‘Secure Boot’ that can come in between. So since you’re ditching Windows, simply disable ‘Secure Boot’ in BIOS and you should be able to run any ‘Linux’ distribution after that. Good luck. Lengthy but good review. Try to compare XFCE distros as all of the KDE and Gnome F**** are become unusable for day to day task and deviated from desktop experiences. 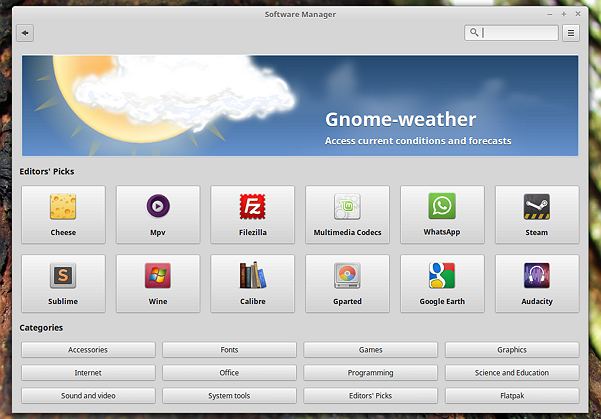 But XFCE (esp Mint ).. Its just perfect and reliable for getting things done. As far as I know, it is the only distro have perfect /superior font rendering. Others have been broken after some period of time. Gone are the days where mint counts as “beginners choice” . Now its a perfect choice for web developers.. Learned a weird lesson running Mint 18.3 on an HP desktop with a displayport video out. I used a displayport to HDMI converter to an HDMI input on my 4K monitor and could not get resolution beyond 1920×1080. I fought with it for a couple weeks, then switched to a cable that was displayport at both ends and plugged it into the single displayport input on my monitor. Worked great! I assume it is both hardware and software. Same adapter cable combo with same monitor and similar pc running Win 10 work great. I installed Mint Mate 18.3 on two very old computers (laptop and desktop) that originally had Vista on them though they are 64 bit core 2 duo’s. Desktop has 8gb of RAM. Best thing I could have done. Fast and responsive. Also have two Win 7 builds that I may switch over or at least dual boot. I have been using Linux Mint Cinnamon for years and it only gets better. I am currently on 18.3. I have used LM on my own home built desktop and three laptops( 2 Dell and 1 HP). I have never encountered a serious problem. I am only a home user now and am in Firefox most of the time. I have never tried LM with anything but basic hardware. Cinnamon is a traditional WIMP desktop that will be familiar to Windows and Mac users. I like Windows 7 a lot and could still be using it or a tweaked Windows 10, but the cost of Windows is still slightly higher than FREE. I also got a bit tired of taking whatever Microsoft dished out. I think there are about 200 Linux Distributions from which to choose. 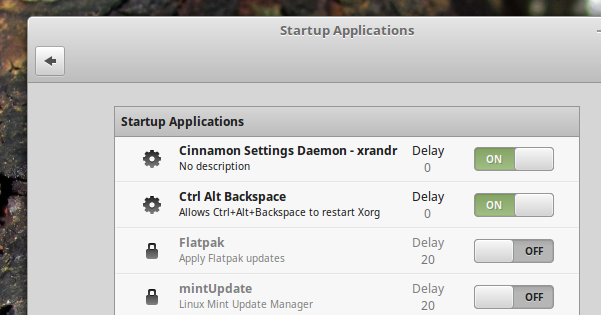 I can recommend Linux Mint Cinnamon. Thanks. Great article. 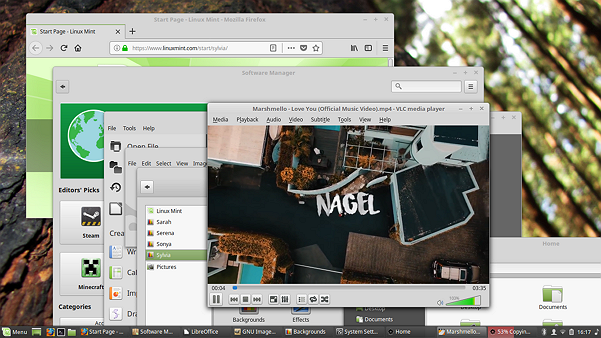 Linux Mint is one of the best distributions for noobs or advanced alike. Of course, Linux offers something for everyone that can be tailored to the individual and how they use their computer. I have come under the spell of Deepin 15.5, and now 15.6. It, like Mint, is easy to use and is also suitable for the more advanced user. I am also impressed with KDE’s Plasma. The year of the Linux desktop never officially arrived but those of us in the land of Linux it sure feels like it has. There are so many great distributions that rival, and even surpass, anything being put out by the proprietary camps. You’re welcome and thank you for the response. 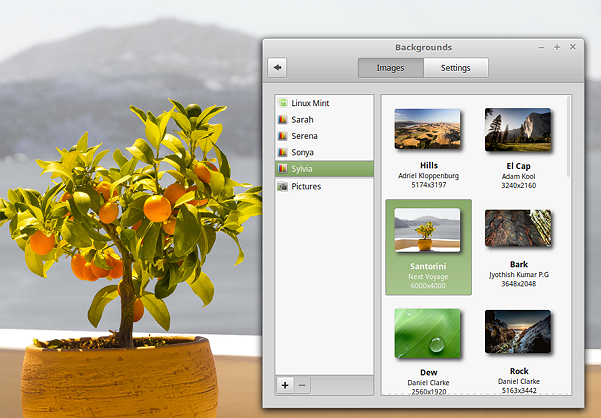 Linux Mint has now released 19 ‘Tara’ and they hit it out of the park again. I decided to install the new Linux Mint Debian Edition 3 with Deepin 15.7 in a dual-boot configuration. One thing I noticed about LMDE3 is how fast it is. This edition is very close to the main edition in look and operation, the differences are small. I noticed that there are not many reviews on LMDE3. This distribution is worth a serious look because it deserves it. I have always maintained a Linux Mint Cinnamon main edition on at least one of my systems because it never fails to be impressive. LMDE2 was not bad, nor was it standout. I was completely blown away by the polish and speed of LMDE3. So much so. that it now serves as my go-to Linux Mint distro. Perhaps, others would feel the same way if it received some airplay. Maybe you could put it through its paces and share the results in one of your great reviews. Thank you for the suggestion but it’s been a few months since it’s release. But I’ll definitely review it the next time. That would be great. It is more suited for intermediate and advanced users because of the Debian component but it really is a great distro that gets over-shadowed by the Mint main edition. It is well deserving of some airplay. It has performed near-flawlessly for me. I had intended to only test it but it has proven quite impressive. Now I intend to prepare for a reinstall on a properly configured machine it will be remaining on. I did a quick install and did not set things up as I would have for a production-ready daily driver.